You are here: Home » Blog » Homemaking » Sourdough A to Z eBook: Win a Copy! Sourdough A to Z eBook: Win a Copy! Sourdough is a champion traditional food (don’t miss Stacey’s post on sourdough next Friday). By slowly fermenting the grain during the souring process, it becomes easily digestible (sometimes even for those with allergies or particular grain sensitivities), it reduces phytates (for better mineral availability and absorption), it even lower the insulin response to consuming the carbohydrates. Even better, sourdough baked goods are simpler than you might think to make and very frugal. There is no added yeast necessary (a beneficial thing, because store bought yeast contributes to systemic yeast issues in the body), and the overall result with sourdough is just good, wholesome, tasty and nutritious. It is quickly becoming my preferred way to prepare grains and make baked goods. Last fall, I reviewed the Sourdough eCourse from GNOWFGLINS, experimenting and learning all of the varied ways that sourdough can be used. Far beyond basic bread, sourdough methods can be applied to breakfast foods (crepes, pancakes, muffins), crackers, pizza dough, biscuits, and even sweet treats like cinnamon rolls, cake, cookies and pie! I absolutely loved the eCourse contents and especially the videos, but I know that the cost of such a course isn’t a possibility for everyone. When Wardeh let me know that she had compiled an eBook with the same basic contents of the eCourse, I was thrilled. No, you don’t get access to the videos and some of the amazing tutorials or the member forums that come with the Sourdough eCourse, BUT you still get all of the printed teaching material, and all of the amazing recipes, with very detailed instructions. Another great addition to the eBook is tips and fresh ideas and adaptations that have been contributed by those who took the eCourse and participated in the forums. The Sourdough A to Z eBook sells for $20, which I think is a complete steal (unless you’re a GNOWFGLINS eCourse member, and then it’s even cheaper). The amount of information packed into this 150 page book is 100% worthwhile, and I have no hesitation in recommending it to you wholeheartedly. This is honestly the best and most comprehensive resource on sourdough that I know of. With 5 different authors collaborating their knowledge and experience to write it, and 25 detailed lessons, it will answer all of your sourdough questions and have you preparing incredible foods for your family in no time. Though I rarely print out eBooks, this is one that I would consider printing out to have in a binder as an easily accessible resource and recipe book. I know, it sounds like I’m being a bit over the top. I try not to gush about products, but it’s hard not to when it is one that I personally feel is an incredible resource and great value. Although I’ve been making sourdough breads on and off for years, I’ve been recently looking into the science of sourdough in a more in-depth way recently. Since our family has been struggling with remaining grain-free for a variety of reasons (although I still absolutely feel that GAPS is an excellent diet for healing the gut, reversing allergies and helping other disorders and disease as well), I’m looking for other ways to help improve my family’s digestive systems and food sensitivities. Sourdough is promising in this regard, because it helps to pre-digest the grains (making them far easier on the gut than other methods of preparation), greatly reduces disaccharide content in the finished product (while most baked goods are very high in disaccharides), and can make gluten and grain proteins tolerable for many who usually cannot tolerate them. Impossible Pies — our no-wait, healthy variations on the Bisquick impossible pie! Right now, until April 11th 2011, everyone who buys a copy of Sourdough A to Z will also receive a free thank you video of their choice, a $10 value! Or try to win one! Wardeh has graciously offered 5 copies of the Sourdough A to Z eBook to give away to my readers. Would you like to win one? 1. Tell me what intrigues you about sourdough and why you’d like to win (or which recipe you’d most like to learn to make). 3. Share about this giveaway through your blog or favorite social media (find us on Facebook and Twitter here). Make sure you get entered in the ebook contest! I have been hesitant to try making sourdough because I’ve thought that it sounds difficult, however, this eBook seems like a great resource to get me started! I’m very intrigued by the health benefits of sourdough & I think it’s interesting that you can do so much more than just make bread with it! I would love to learn how to do sourdough to make healthier grain-based foods for my family. I tried making a rye sourdough starter once and it was a total flop! I am so interested in sourdough and learning how to make my own starter to use for baked goods. I am excited about incorporating it into my normal routine for baking! I am already one of your subscribers! I would love to learn more about sourdough and how to make it! It’s something I have been curious about for a while. Sourdough is so much more flavorful than rapid rise recipes. (Not to mention healthier.) However, the batch I attempted had a few…issues. I’d love to win this book so we can avoid further disasters. I subscribe to Keepers of the Home. I would like to win a copy of this book because my first attempt at working with a sourdough starter didn’t work out well. I still want to make fresh bread for my (mainly grain-free) family, but I’m leery of attempting this again without proper instructions. I have never made anything with sour dough and I would love to try. I would love to try the No-Knead Sourdough Bread. I love baking bread, but a new digestion troubles have really put a damper on it. It would be great to try out sourdoughs and see if it helped. I would love to learn how to make some different things with my sourdough – I currently regularly make bread, and I enjoy making pancakes and cinnamon rolls, but that’s as far as I’ve gotten! Well, so far I’ve only make bread and a cake with sourdough, so I’m interested in ALL the other recipes. Honestly I don’t know much about the health benefits of sourdough, although I would really like to learn! I just really love the flavor it has! I’m not sure what recipe I would like to try there are so many things I make now that I could transition to sourdough rather than yeast, so I think I would be testing out quite a few recipes~ no specific one in mind though. I would love to make some sourdough cookies! That sounds fabulous! I love the taste of sourdough and love to eat any bread with lots of butter and i think sourdough is a healthier choice. I have tried and failed a few times to get it going myself so I’d really love this book to help boost me. And which recipe would I like to make?? All of them! I love the taste of sourdough, the health benefits and the ease of making a sustainable levener in case of emergency. I’m also an email subscriber and I like you on fb. I would love to learn how to make sourdough bread. I’ve never tried it!! I subscibe via email. Thanks! and I subscribe to your rss feed and your email list! The recipes all look amazing, but the chocolate cake really intrigues me. I would LOVE to win this, since I have tried and failed several times at making a starter. Plus, I would love to have sourdough (that my whole family loves) without HFCS, and healthier flour than at the store! I really want to learn how to do sourdough, because I am convinced it is healthier. But I am totally intimidated by it!!!!!!!!!! I’m sharing on Facebook…..right now! I already am a subscriber! I would love to make that famous chocolate cake! I am so excited about this giveaway! We *try* to eat TF, but I make a lot of plain whole wheat bread, because sourdough intimidates me. I’ve just been thinking the past few days that I really need to delve into sourdough “how-to’s”, and get on with it! I would love to feed my family sourdough instead, because I know it’s more beneficial to our health, and yeast is something we struggle with. I subscribe via e-mail. I’ve tried making sourdough in the past with mixed results. I used a recipe from Stan and Floss Dworkins book and actually got a starter that worked moderately well, I used the recipe in The Little House on the Prairie cookbook and had a massive fail. I’ve never gotten a sourdough starter that made my bread rise the way that I thought it really should however, and even my most successful efforts have discouraged me in terms of keeping the starter going. So, while I love sourdough bread, I don’t feel like I’ve been very successful at it yet, but I’m willing to give it another try. I have shared the link to this giveaway on facebook. I follow Keeper of the Home via e-mail. Sourdough is so intriguing to me because it’s ALIVE! It’s like a pet that you take care of and it gives back great health benefits. I’d love to win so that I can learn how to use sourdough to make all kinds of healthy baked goods for my family. I would enjoy having a comprehensive guide to making sourdough bread and baked goods for my family! I’ve been curious about sourdough but never delved into it. Healthy consumption of grains would be a wonderful benefit to my family. I want to learn about the no-knead sourdough. I would love to add sourdough to our diet – but I’m intimidated! This book would be a great way to get started on something specific. I’ve been a longtime subscriber, and usually have a starter in my home because my mom always shares it with me, but I’d love to branch out from just a regular sourdough bread that I make and read the ebook for the other great sounding recipes! I’m also sharing a link on Facebook for this. THANKS! I’d like to learn how to make the pies!! I’d love to be able to toke the video course, but where my husband and I work (W. Africa), our internet service is neither fast enough nor reliable enough for that sort of a thing. So, the next best thing would be the book. I love sourdough and am planning to learn how to use it this summer, once the school I serve in is out for break, so the publicationof this book is perfect timing. I have read your blog for quite some time. I have acquired a lot of knowledge of “real foods” but have yet to dive in. This may be a good way to begin transitioning my family. Who doesn’t love bread?! I like the idea of the nutritional value of making sourdough bread, cakes, grains and beans. I have made several in the past and my whole family loves them. They never know they are eating healthier foods. I want to learn more about sourdough, because of its lower insulin response. I have shared via facebook about this giveaway. My family is trying to live a better healthier life by eating right. I would love to learn how to make sourdough. I have tried a few times and couldn’t get it right. I liked your facebook page plus shared it with my friends. I’ve tried sour dough in the past. My first attempt was good, but I didn’t keep the starter going. Later when I tried making a new starter I failed miserably. I’m sure this book is full of great hints, plus I’m curious about the variety of things you can make with sour dough. I would love to win a copy and further our healthy eating. I have yet to attempt sourdough, but this looks great. I like the fact that sourdough is ages old in origin. That appeals to my sense of wanting to be connected to my ancestors somehow. Sourdough intrigues me because of how you can keep growing it. I would like to win because I have tried making sourdough twice and failed. I need more info on how to do it. I am most intrigued by the nutritional benefits of sourdough, and I think it would be super cool to have a starter to pass on to my kids and friends that I’ve had for forever. I am already subscribed through email. I would really love to learn about making sourdoough with gluten free grains! I love sourdough! I don’t even like “regular” bread that much anymore. There is one recipe I make with consistency; however, I wouldn’t mind having more sourdough ideas. I like that sourdough has its own wild yeast without having to add commercial yeast. I love to win to learn techniques of including sourdough in all the bread products we make. I am subcribed via both email and RSS. I love traditional foods and Sourdough is one of them. I would love to know what to do with it. It’s always been so intimidating and I didn’t know you could do more than just plain bread. I am interested in sourdough’s nutritional benefits as well as how versatile it is. I love sourdough, but so far have only made bread, pancakes and crackers. I would love to have new recipes to try. I have tried sour dough before but was never able to keep it alive because all I did with it was bread, and we really don’t eat that much bread! I would love to try again, but this time do more things with it; like muffins, tortillas, etc. What intrigues me the most about sourdough are the potential health benefits. Our family is very much into natural health and trying to stay healthy as much as possible, rather than just treat sickness. My husband loves sourdough, and it would be great if I could make a healthier whole wheat version! I absolutely LOVE sourdough bread and so does my family! I would love nothing more than to learn to make it at home so I know that I’m providing my family with a healthy treat! i’ve tried a bit of sour dough baking, but i feel intimidated still. i’ve only made things that don’t depend on a good rise. i want to be brave and try a real loaf of bread! I also already subscribe to Keeper of the Home. I have experimented a little with sourdough. I received some Amish Friendship starter, then branched out and made pancakes, pita bread (better than store bought) and corn bread. I would like to receive the ebook and thanks for a great blog. I am already a subscriber to the blog and I shared this on facebook. I haven’t tried sourdough yet, but it sounds great. I am especially interested in the fact that it is easier to digest. I have subscribed to the RSS feed for the last few months. I am really enjoying my emails from you (I’m a subscriber). Keep up the great work. Coincidence? I received my water Kefir grains in the mail the day that you published your blog about water kefir. I love it! I am pretty excited to learn all about sourdough. I have been sprouting grains/seeds/beans lately and would like to expand my knowledge with healthy breads now. Thanks for all your hard work; its really appreciated! Oh, and here is my “subscriber” entry. The last one was my what I want to learn about “sourdough” entry. And hey! I tweeted about sourdough! I need this book, I am a sourdough DUMMIE !!! I love sourdough and would love to make it myself. I mill my own grain and this is always something I wanted to learn more about. Thanks! I would love to have this book so I’m not as dependent on yeast – something I have to purchase at the store. We’ve been GF for awhile for my son’s developmental delays and I really miss bread! I’m hoping that we can eat/tolerate sourdough breads, but I’m kind of scared to start! Thanks for the giveaway! I subscribe to KOH via email. I would love to learn how to make more than just bread with sourdough! I already subscribe via email to Keeper of the Home. I have never tried sour dough, but I am very interested, especially in pancakes, waffles, and muffins! I’ve NEVER made sourdough anything – somehow, even though I’m well-versed in the kitchen, it seems intimidating to me. I love the idea of taking that wonderful sour flavor and the health benefits into other arenas of food! I would love to learn more about sourdough and how to make it for my family. I love the taste! I want this! I’m really interested in those crackers – I’ve tried making crackers before and not been happy with the results. I already subscribe to KOTH. I shared about the giveaway on my FB page. This looks great! I am really interested in the health benefits of using sourdough and finding out how to use this method for many different recipes. I have been hearing a lot of good things about sourdough lately and would like to try it. I would love to win this to help me get started. Thanks! The things that intrigue me about sourdough is the chemical changes it goes through when naturally fermented. Even better, it is the process what happens in our body when we eat it that I also find interesting! I am most intrigued by the incredible health benefits of sourdough. I cook/bake all the time and am constantly looking for healthier ways to feed my family. I am subscribed to keeper of the home. I blogged about this giveaway and posted on facebook. I love sourdough because it is so natural and easy to keep going, and I would love to know more about it! I like sourdough because of the health benefits and to me it seems cheaper to make foods with it (especially when we have to buy our milk instead of getting it from our goat!). I would love to win because the only thing I make successfully right now is pancakes and waffles. I already subscribe via RSS! Love your site! Recently I have been seriously thinking about learning to make sourdough breads. This would be a great addition to my education! I have never done sourdough and would love to learn how! I subscribe to your letters. I’m actually a litte afraid of sourdough…I tried to catch some yeast and it ended up horribly! I love sourdough bread and it would be awesome to make it myself! Plus, Cinnamon Rolls from sourdough… sounds heavenly! i have always wanted to learn how to make my own sour dough! for one i love the flavor, but two it is so good for you that i would love to incorporate it into all the doughs we make! hope i win! i would try it in our wheat everyday bread first!! I would love to win this book because I would love to try the gluten-free recipe. I have wanted to try to do my own sourdough for years but then we went gluten-free when my son was diagnosed with Celiac disease. I just think this would be a great asset to our new-found lives in our pursuit of eating more natural foods as opposed to processed foods & substitutes. i am a subscriber by rss in my google reader. I started on my own sourdough adventures about 6 months ago without a lot of success. I would love to have something that would teach me so that I can incorporate this healthy habit into our lives. Thanks so much for the opportunity!! I have always been intrigued by sourdough and the ladies who blog about making things with sourdough. I have just always assumed that it is too hard for me to do!! I would love to read this book and get started!! I did the e-course this book is based on, but I’m much more of a book person. I’ve been experimenting with sourdough for almost 10 years now, but my current starter has been alive and kicking for about a year and a half now, which is a record for me. I’m really committed to finding new ways to make it part of my daily kitchen routine! I am just starting to read about sourdough and it’s health benefits. My son is 2 and I have slowly and surely been changing my family over to a real food diet. I have been trying to work with sourdough and I cannot seem to get the hang of it. I would especially like to understand the starting a starter, caring for it, and how much to use in bread recipes. Thank you for making me aware of this ebook. I’d be interested in learning crepe recipes. I visited a friend in Chicago many years ago, and she took me to a crepe place–that was their specialty. I’d never had one before–it was wonderful! I’d love to be entered to win the book! I just signed up RSS feed to your blog. I love sourdough, I’m so intrigued by this course! I’m subscribed to keeper of the home by email! I would love to have a continuous supply of healthy homemade sourdough bread! I definitely need to know more about it first, though (I have my starter already). I’d love to win a book! I am interested in all aspects of Sourdough. I have been making sourdough bread for a couple of years now. I would love to be able to use and give my daughter in law a gluten free sourdough starter. I love trying new recipes too. I have always wanted to try my hand at making my own sourdough! I would love to win it so I could give it a try! I would love to have this book…I already make bread with sourdough and we love it. I would love to have a whole book with recipes, tips, etc. I am interested in breakfast recipes like pancakes and muffins. Would love to win the book! Thanks. The chocolate sourdough cake sounds interesting. Aside from wanting to make sourdough because I love the taste, I really love the idea of starters lasting a lifetime and being able to share the starter with friends and family. It’s such a unique thing! I am having trouble with regular yeast and thus I am looking into sourdough. I have been looking at this book and considering it. Winning it would be wonderful. I’m very intrigued to try making sweet things with sourdough, as I’ve only used it for bread or pancakes before. I subscribe both via RSS and email. I would like to learn how to make sourdough Bread! I would like to win because sourdough sounds so scary to me, but I know that it’s probably not if I just had some instruction and good recipes to try. This book seems like a good fit to help me get started! I tweeted about this contest (@halfasmany). I cannot tell you how excited I was when I received this new post by e-mail! My mother and I took the e-course and have recommended it to many of our dear friends too, but non of them had the time to take the course. When I read this I got so excited, knowing that I could just refer them to the e-book instead!!!! YAY!!! I have shared about the giveaway through Facebook! I am very interested in learning how to make sourdough breads for my family. I would love to win this! I am about 5 weeks into my sourdough adventure, and am having a hard time making bread that doesn’t taste like solidified vinegar!! I have been wanting to try sourdough, but it has always sounded a bit scary :/ I think this book would be just what I need to take the leap! I don’t know much about sourdough, but love the taste and health benefits you get from it. I can only imagine filling my home with the wonderful smell of sourdough. Wow, what a fantastic looking book! I can’t have wheat or sugar. Sounds like this would have some great (& yummy) tips on baking I might be able to eat. That would be so cool! I love sourdough bread and would love to know how to make it. I have been wanting to start bread making. I have always enjoyed sourdough, but I never knew there were so many benefits. I have only had white (enriched) sourdough bread, so I assumed it wasn’t too great. I really want to start a sourdough routine! I first learned to make bread using sour dough from my aunt. I haven’t made sour dough now for many years except through some experimentation that didn’t turn out very well. I would love some expert help in this area. I am already a subscriber and enjoy your site a great deal. Thanks! I’d like to win! I have wanted to try sourdoughs for a while. We have a pizza thing around here and it would be better on our wallets and our mid-sections if we made it at home, so the sourdough pizza dough is what I’d most like to try. I’m subscribed to Keeper of the Home. I’ve been an on again, off again keeper of a sour dough sponge. even so I never got good at making sour dough bread which I really love the taste of. I really hope to win this! I love that it is a traditional food & it’s health benefits. Would like to incorporate it into more recipes. Thanks for the opportunity! I’ve heard so many good things about sourdough but have been intimidated to try it. This book would be a wonderful way to get myself going on it! Thanks for the giveaway! I would love to know how to make sourdough bread! I love the idea of not needing yeast to make wonderful bread. I am already subscribed to get emails from Keeper of the Home. I just started with sourdough starter in January. I love making crackers! The breads I have tried haven’t turned out quite right yet but I am still trying. Not about to give up on this one! I just love how sourdough is easier for the body to digest and tastes! I’m interested in trying new recipes. Since my hubby is a youth pastor and I am a stay at home mama with three under the age of four I haven’t be able to take the ecourse yet. This book sounds like a great option!! I already cook with sourdough, but I still consider myself a beginner. I’d love to learn more ways to use it! I love the rich taste of sourdough. It’s better than any other bread. I didn’t realize you could make so many other things with it! I’d love to try scones and pot pies with it. I would love to have this ebook. I’m reading How to Bake a Perfect Life by Barbara O’Neal right now and it talks quite a bit about bread. I’d love to give it a go…with some guidance from the book! 😀 Thanks for the giveaway! I am intrigued by how many different things can be made from sourdough – I never knew. I guess I have a lot to learn. The donuts and cookies would be interesting to try. I am intrigued by how many different things can be made from sourdough – I never knew. I have gluten and yeast issues – so this sounds like it would be a good route to go. I guess I have a lot to learn. The donuts and cookies would be interesting to try. I am subscribed through your RSS feed reader. I’d love to learn about the pocketbread for sure! That would be an awesome addition to our family’s dinner menus! I like that sour dough is easier to digest! I would love to make homemade crackers but need a good recipe and good directions!! Sourdough is such a wonderful picture of the quiet way God’s Word works its way through to men’s hearts. No big explosions, no fanfare, no flashy advertising/packaging. Quietly, steadily, gently, it grows and makes something better than it was. Because it shows us the pattern of His ways, (and because it is delicious and good for us!) sourdough fascinates me. I love learning about anything that is a more natural way of feeding my family. I’ve seen the sourdough information, but haven’t had time to really dig in – I’d LOVE a copy of the book so that I’ll have the information at my fingertips! Also, I subscribe via email and RSS. I have only made a sourdough once, years ago. I have been reading about it and am interested to try again. These recipes sound really interesting, especially the pita bread. We love pita! I’ve always been intrigued by the many uses of sourdough beyond simply making bread and if I won, I think it would finally inspire me to tackle learning how to make it/use it. I just love the idea of having such a natural riser for my bread. How much more self-sufficient can you get than rising your own bread from naturally occurring yeasts? By the way, do you know if any of the recipes use any other kind of leavening besides sourdough starter? Thanks! I have completely fallen in love with the idea of soaking grains. Even my family of picky boys have noticed the difference in their diet. I tried to start a sourdough, but failed. I have actually been saving up for Wardee’s e-course . If I could win the book that would put a huge smile on my face. I have honestly never tried making sourdough breads but I love to eat them. This would be great to get me motivated to make my own. I subscribe via google reader and get your email. I really want to explore sourdough for the health purposes, for the nice crust you can usually get on it and because i am starting to suspect that I need to limit my yeast consumption. My children do not process grains well. I believe they could tolerate sourdough better. We don’t find it in the store often so I would love to be able to make our own. However, I find it very daunting! I am not sure if we are supposed to leave a comment for each entry – I won’t just to be sure I don’t clog up space!!! I am interested in sourdough because I have read so many wonderful things about it – health – and YUMMY! I am beginning to learn about sourdough and love the flavour and texture of good sourdough bread. I think winning this book would give me the courage to try making my own. I want to try my hand at sourdough because it’s something that has always intimidated me and I have never tried before. But my husband loves sourdough bread, so I really ought to overcome my insecurities and give it a go. This book would be great to help me with that! I would like to know how to make dinner rolls and ive heard the chocolate cake is amazing!! I don’t personally know anyone that makes sourdough 🙁 I can’t believe all the recipes!! Well, i guess I didn’t win on on Wardeh’s site! so, I’ll try here! I Love my pet sally the sourdough. But I really only use her for pizzas! I know there is so much more I could do with her. i would love to do crackers and cakes! Yum! I love sourdough. I’d love to learn about tortilla chips and doughnuts! I’m interested in learning more about sourdough because my mom used to use it quite often during my childhood, but it always gave my dad a “sour” stomach ache. I’d like to find out ways to use it in which he wouldn’t get sick from it. I’m an email subscriber – thanks! I’m subscribed to Keeper of the Home emails. I’m interested in sourdough as a healthier grain option…and I’m especially interested in using it to make breakfast treats like muffins, scones, etc. I love sourdough because it feels good in my stomach, and tastes great on my tongue. One of the things about sourdough that I find intriguing is how you can have so many different strains of natural yeast depending on your geographic location and how they all work similarly but can have different characteristics…so cool ! I’d love to win the giveaway so I can learn a better system of tending and using a starter. I had a starter a few months ago but would loose track of when it needed to be fed and would forget about it in between uses. Thanks for the giveaway ! Would love to win this book.. It’s a traditional way to prepare food, what’s not to be intrigued by! I would like to try sourdough for the health benefits. We currently buy sprouted bread from the store which is expensive! I am a subscriber also. Thanks!! i’d love to try the gingerbread and, as a self-described scone-snob, the scones. This looks amazing! I tried my hand at sourdough a couple months ago and after multiple failed attempts gave up for the time being. I would love to have this book and try again! 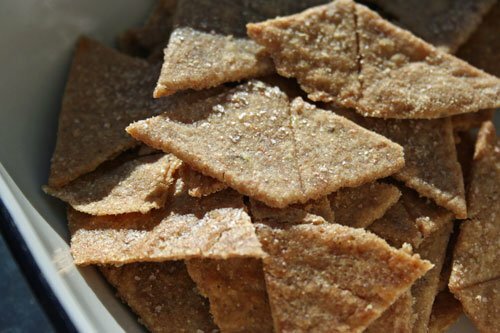 I really want to learn how to make sourdough for the health benefits but after seeing the pic of crackers at the top, I need to learn to make homemade crackers. That’s one thing I can’t seem to get away from buying at the store and my boys eat them as snacks almost every day. I have a starter and would love to learn to make scones! I’ve been wanting to do sourdough for over a year but am so intimidated. I’d love to just begin with bread. I’m intrigued by the health benefits for myself and family. I have started using sour dough in the past month. My family is fighting a battle with Lyme Disease and Lyme needs yeast to live on. So we have cut all yeast out of our diet. But we can use sourdough… so I am learning all I can and trying to find recipes to use it in!! Im a an email subscriber. My sister is into soaking grains and all that, and I would love to share this info with her! I think the Cinnamon Rolls would be yummy! This book would be totally valuable for us as we look to transition off the GAPS Diet at some point in the next few months – I’m thinking I need to start doing sourdough bread… but I’m totally intimidated by it!!! I have some a jar of sourdough in my fridge that my dad gave to me before he passed away. I’d love to know what all can be done with sourdough (beyond the bread that I make very infrequently) and what I need to do to take care of the starter. I’m a subscriber too. Do I need an additional entry for that? I’ve always loved sour dough bread but I never knew you could use sour dough for so many things! I’d love to get this book and start experimenting. I always had an interest in making my own sourdough, it sounds so good. I just added your RSS to my feeds. I have the systemic yeast problem & have been meaning yo try sourdough to see if it helps! I am a subscriber, too. It sounds interesting and I would like to try it. I would love to learn how to make crackers using sourdough. I have heard that it is much better for you. Plus, it reminds me of my grandmother because she always has made homemade sourdough breads. I would enjoy learning more about it and how to make it. Thanks! Subscribed and ready to win! Lol! I’m on GAPS right now to hopefully heal my wheat allergy. I’d love to learn about sourdough for transitioning off of GAPS and also for my family. My husband eats white bread and we’re delaying giving my son wheat (he’s 1) to hopefully minimize chances of an allergy. We would definitely have to try the pizza dough and tortillas in addition to the sourdough bread! We’ve been curious about it for quite some time and just haven’t found a good resource. It looks like we have now! Thank you for the giveaway! I’d like to learn to make the pocket bread. @Kim Monday, Forgot to mention I already get your news…. Love Love Love it…. i really desire to learn about baking with sourdough. it all seems overwhelming to me, so i think this ebook would be a great help. the gingerbread recipe is one i would definitely try! I would actually llke to earn to make sourdough bread itself! I would love to learn how to ferment breads, and how to get the natural yeast and natural gluten to work together, without adding gluten to the bread. I’ve been wanting to learn more about sourdough starters for some time. My husband cannot do yeast so this would be the perfect book for our household. I would like to try bread. My mom is teaching me how to make regular bread, and this sounds like something i would like to learn as well. We like sourdough bread and I would like to learn to make other sourdough too. I’d like to win this giveaway b/c I LOVE the taste of sourdough bread and it would be amazing to be able to make it at home! I’m torn between cookies and pocket breads as the most exciting sourdough applications. The cookies lesson would allow to make great breakfast cookies, and the pocket bread would break up the current monotony of sandwich breaad in my house at the moment. I’ve been interested in sourdough for awhile, but it really intimidates me. It seems like a really nice “healthy bread” option, but honestly I’m afraid I’d mess it up. This book sounds great! I have a sourdough starter and I am at a loss for what to do with it every week! I make bread, crackers, english muffins, and naan–but those are getting old fast! I would love to win this and have some new inspiration! I also subscribe to your updates by e-mail! I am fascinated about it’s growing conditions, that true sourdough only comes from certain climates! I would love to have this as we are just starting to tackle making the breads and baked goods healthier. We are changing our diet a bit at a time. I would love to have this as we are just starting to tackle making the breads and baked goods healthier. We are changing our diet a bit at a time. I would like to learn to make the bread and English muffins. The lack of dependence on commercial yeast intrigues me :-). As does the health factor. I already am a follower and have been for a long time! Thanks for the opportunity. I would love to win this book simply because of that LIST you included–it has EVERYTHING! It looks so great, I’m especially interested in making my family’s bread/baked items healthier. I eat GF so I don’t eat any of what they eat, but I’d like to be able to make it for them! I would love to make the pizza crust. I subsribe to this blog and I would love to win a copy! I’m intrigued by making gluten free sourdough as all the other gluten free breads out there leave much to be desired! I subscribe in an RSS feed! I am a subscriber & LOVE to read your blog. I would so love to win this book. I have been wanting to find the “perfect” sourdough recipe. I was all ready a couple years ago & then our son was diagnosed with Celiac Disease. We have complete revamped our diet to be gluten free on his behalf. While changing over, I noticed benefits myself. No longer did my back hurt chronically & my knees stopped aching. It was amazing. But, along that journey, I was afraid to revisit sourdough bread with gluten free products in fear that they won’t come out the way I had hoped. I would love to win this book so that I can learn more about sourdough & give the gluten free recipe a try. I would love to be able to make sourdough bread. I have tried in the past with no success. I’ve always been intrigued by sourdough and wanted to make some, but never knew how. This would be a great resource! I liked your link and commented about it on Facebook. I would love to win the ebook. I’ve been dabbling in sourdough but with not much success. It would be awesome to have a guide. I’m especially excited about the no knead english muffins. I am really interested in the sourdough pasta, and muffins. I did not realize you could do so much with sourdough. By the way, I discovered your site through a link to this giveaway. I am so happy to have discovered it. Just with the little I saw, I know I will love it. Now I just need to figure out how to subscribe to the RSS feed! I keep hearing about the health benefits and would love to incorporate it in our diet. I shared on facebook under Creative2xmom. I would like to learn how to make muffins of all sorts. I’d really like to learn how to make gluten free sourdough. I miss it now that we are GF. i have been wanting to know the sourdough basics. when i come off the gaps diet thats one of the first things i can’t wait to try! I subscribe by email, thanks for the giveaway! I have never made my own sourdough bread and have dying to try it. I’m just a little intimidated by it. This book would really help me to be able to make not just bread but all those other wonderful things! I’d love to learn how to make sourdough bread! I love the idea of making sourdough because it’s supposed to make the grains so much better for you – and I love the flavor! What a great giveaway! My past attempts with sourdough have been, well, failures. I would love to master this technique since we are already soaking all of our grains anyway. Sourdough seems like a much simpler, and tastier option for soaking grains. I’ve tried sourdough in the past and enjoyed it, but had trouble keeping it alive 😉 Would love to try again with a little more direction, sounds like a wonderful book! I am always looking for ways to improve our guts and make grains more easily digestible…plus sourdough is yummy! I subscribe to Keeper of the Home via GoogleReader. I’ve wanted to try sourdough bread for a long time because my family enjoys it. I’ve been learning about its health benefits, so now I want to try it even more. But, I never knew sourdough was so versatile! I guess bread would still my first choice to try, but pizza dough and scones are certainly intriguing, as well. I subscribed to Keeper of the Home via email. Thanks for the extra entry! I’ve never made any sourdough, but keep reading about it and would like to give it a try. I have also just started following the GNOWFGLINS. Seems this would be a great source to learn from. Oh yes please- I want to win!! Everything intrigues me about sourdough and I have been too chicken to try it since I have had two failed tries. Both were my fault in not following directions properly but still- fear. I would honestly try everything. Thanks for this opportunity. I’d love to learn how to start a starter! My favorite recipe would be bread!! I would love to make sourdough crackers and basic bread first. thanks for the giveaway! I would love to have this book! I purchased a sourdough starter through Cultures of Health but haven’t had the guts to try and get it going yet. I really want to be able to make sourdough bread, crackers etc, seems alot easier than making bread every time and tasty!! I would love to try the No Knead Sourdough with many uses. I love to make pitas, but making sourdough pitas would be much better! I have never worked with sourdough before, but I would like to learn how. I need to learn how to prepare bread for my family that doesn’t include yeast which, as you said, can increase the yeast in your body. Also, this would lower our cost in bread buying. I love the taste of sourdough but have never attempted to make it at home. I’d love to learn how!! I subscribe to Keeper of the Home via RSS feed. I have a sourdough starter and have used it to make bread, fruit loaf, chocolate cake, pizza dough and crackers. I’d love to try even more recipes from this book. Thanks for the opportunity to enter. I am intrigued about sourdough because of it’s gentler nature on the digestive system. I would love to win this book so I can make my own tummy friendly breads and further my committment to knowing exactly what ingredients are going into my family’s bodies! I am recently gluten free and my naturopathic recommended sourdough! I would love to have this book! I love sourdough because my dad used to make the best sourdough bread and he had his own starter! I have his recipe, but it never tastes the same as his. I would love to win! I would love to win a copy! The thought of sourdough fascinates me but scares me at the same time! This is exactly what I have been looking for – I read blogs all the time (of course), but the potability of published print fits in with my life so much better. Plus, this is an area in which I dearly want an education. I want to see how sourdough effects my thyroid. I love the taste and would love to learn how to make breads that are healthier. Thanks! I am a subscriber through emails! I would love to win! What intrigues me about sourdough is that you can do so much with it, and how it’s a really healthy way to eat grains…I also remember reading about Ma Ingalls making sourdough bread out of soured milk, and for some reason it stuck with me as something worth trying. I would love to try making sourdough honey whole wheat bread. I make all our bread at home but have yet to try sourdough. I would love to provide this healthy food for our young family of five! I have tried to get sourdough started a couple times without success so I would love to win this e-book. I would really like to try my hand at some sourdough recipes like pancakes or cake. I am intrigued by the “easy to digest” and “lower insulin response” attributes of sourdough and would love to learn how to use sourdough for more applications than the traditional bread! this one has been on my list of things to get someday as soon as I found out about the ebook. Maybe “someday” will be here sooner than I think 😉 It’s been years since I made sourdough bread (for soup) and I can’t remember a thing about it. I’m not sure what intrigues me. As far as which recipe? I’m not sure, there’s so many I want to try…crackers, pizza dough come to mind. It’s fascinating of so many things one can make from it. I’ve never been a fan of the taste of sourdough, but I’m willing to try anything that is easy to digest. I’m intrigued by the concept of making non-bread sourdoughs, maybe even finding something that will mask the strong sourdough taste. I’d like to win the eBook because it’s the only way I can afford to read it now. I signed up for your e-mail feeds. 1. Sourdough intrigues me … initially I found it weird to think you could leave something ‘going off’ on the counter and still eat it. My sisters (who do not eat sourdough ..yet!) call it ‘Hayley’s festering foods’ as I also have kefir in a jar on my counter! However, as I read through articles on your “Keeper of the Home” website, the benefits are now cemented and I safely and happily feed myself and my kids sourdough bread and sourdough pancakes. My husband eats the pancakes with real maple syrup and fresh cream, but will not touch the bread 🙂 (I know he loves me exploring these natural whole foods though, as he has just bought and started milking a cow, Jenny, for me – we are LOVING the fresh raw milk and cream). 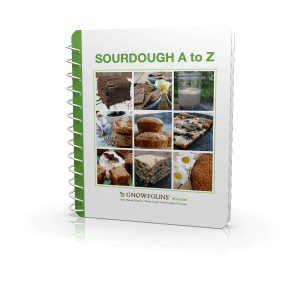 ANYWAY, back to sourdough, I would like to win the ‘Sourdough A to Z eBook’ as I want to explore further how I can get sourdough into my husband and children in creative ways. I want to try cakes and tortillas and gingerbread and I love how you can use it in almost anything!! I am growing my starter on my bench in anticipation of all the new recipes I will be trying!!! 2. I am already a subscriber to ‘Keeper of the Home’. I just subscribed to your blog feed via email – I love this option and look forward to staying current with your blog – then I read this post and saw that it would get me an entry – wonderful. Also. while I’m here for entry #2 I want to let you know that I would love to have this ebook for all the wonderful cracker recipes!!! It is wonderful that you can use sourdough and be gluten free and it taste good at the same time. I am intimidated by sourdough, but I have heard it’s so much better for you, I’d love to learn more about it. Sounds like this book is a great resource. Besides learning about the actual sourdough process, I’d love learning more about using the “extra” dough that needs to be removed when you are feeding it. I heard you can make all sorts of baked goods, and I hate wasting, so it would be nice to learn how to do that! I really like that the process of sourdough pre-digests the grain. I’ve been wanting to learn to make my own starter for a while and learn to make sourdough versions of things we often eat, especially pancakes, tortillas and crackers. Tried to subscribe to your contest email list, but I have no idea if it went through. I tried in two browsers, but not sure if it worked. hopefully it did! I’m interested in using sourdough in baked goods for my children. Does it really taste as good as the regular? Also, I have subscribed to your RSS feed. I love the taste of sourdough and love to make bread. But I’ve never made sourdough bread myself. Didn’t know where to start. This would be a great resource. I’ve love to learn how to make a starter and experiment with different recipes. E-mail subscriber to Keeper of the Home. I’d love to learn how to keep sourdough going all the time and be able to use it for bread as well as pizza dough and pancakes! My family definitely could improve how we eat. We all love our carbs and this sounds like an interesting option. I am interested in the nutritional value of sour dough and how to make good alternatives to things like pizza and tortillas. I’m interested in learning why sourdough is so much healthier than the usual way. After living in San Fran for awhile, I found that I love sourdough! I now live in the Midwest and miss good, homemade sourdough. I’ve never made it and would love to learn how! After living in San Fran for awhile, I found that I love sourdough! I now live in the Midwest and miss good, homemade sourdough. I’ve never made it and would love to learn! I am interested in learning more about the nutrition of sour dough and how to make healthier foods that my kids love….pizza, tortillas etc. I would love to win the Sourdough Ebook because we are just beginning the transformation of preparing and eating whole foods. PLUS, sourdough bread is one of my husband’s favorites and I’d love to prepare it for him (something, I’ve never done before :)!). And I subscribed via RSS! Thank you! I just started making sourdough bread and really want to learn other things to do with my starter. I’ve tried making sourdough starter before, but it died. I don’t know what I’m doing wrong! That’s the major reason I need to learn a new way of starting a starter. I’m obsessed with sourdough! Its so good!!! I didn’t know that there were so many different applications that could be done with it though! I’m interested to learn more. I subscribed to your blog by e-mail and shared this on my FB wall. Thanks! I just recently was told that sourdough is not nearly as hard as I might think…and that really caught my attention because I have always thought it was hard. That was repeated in this post so now I’m even more interested. I’m curious and very ready to start something new. With your glowing review, of course I’d love a copy. More so, I’ve been planning forever to attempt sourdough. This ebook would be the kick I need. I would love to learn how to make sourdough crackers. I keep reading how delicious they are and would like to try for myself. Thanks for the great giveaway! This book sounds like an amazing resource, and as the primary cook for a family who has a lot of eating restrictions, I would love to see the variety of new options that sourdough could bring to our diet! Really never knew sourdough was so versatile. I am ignorant, as I ‘ve never made it before, and would love to learn more! I would love how to use sourdough to make healthier snacks and breads for me and my family. I am especially interested in the cinnamon rolls and tortilla chips. Actually, all the things you listed look interesting! I am excited to see if I win!! I would love to learn how to make sourdough breads that are healthier for me and my family. I am especially interested in the cinnamon rolls and the tortilla chips. Actually, your whole list looks delicious! I love that sourdough is so easy to digest, and I want to move toward using it for more of our baked goods. I really want to make the English muffins! I want to learn how to make sourdough donuts! I have always wanted to try my hand at a sourdough starter but have talked myself out of it for one reason or another. I follow Keeper of the Home in my Google Reader! I subscribe on Facebook and through RSS already. I wish I had time to do the classes, but I am going to make time to sourdough! I love sourdough and have been wanting FOREVER to start making it. I belong to Wardeh’s basic program at GNOWFGLINS, but I just haven’t had the time to sit down and watch the videos and download all the materials. While I still intend to maintain my membership, I believe the book would be SUCH an asset and would help me get going! I want to make it all but I just don’t know where to start. Entry 2) I subscribe through google reader. Entry 3) I shared this on FB – though I don’t know if I really want my friends to enter – I really want to win – Ha!! I am just trying to get a sourdough starter going…so I’d love to learn any of these recipes! This looks so interesting and I would love to learn something new! Thanks for the info and opportunity. I love the idea that sourdough sits on my counter, I feed it and then it feeds me! I have made sourdough cookies, cake, english muffins, pizza dough, waffles, hotcakes and of course bread. I’ve wanted to start making sourdough breads and such for quite some time now. I occasionally make soaked grain bread, but this would open up new healthy meal items to me! I subscribe to KOTH by email. I had a really good starter and was making bread and then it went bad. I would love to make another one and try these other methods. I guess what intrigues me is the possibility of using it for all of these things!! And I have been a feed subscriber. Thanks!! I love sourdough so what intrigues me is to use it more in baking. I love your cracker recipe…I love my homemade sourdough pizza dough and pancakes…and then I’m stumped. I just love the sour taste of sourdough but haven’t been able to get the right sour on my own. Here is my comment to enter! I would love to learn how to make the biscuits, pizza crust, pasta, crepes, and so much more – pretty much all of them! I’m still learning a lot when it comes to creating my own foods from scratch. My mother never taught me anything about cooking, her idea of cooking was TV dinners. Now I am a mother and I am striving to raise my daughter in a much healthier way. It’s important to me to learn many things I can make myself so that I can teach these important skills to my own little girl as she grows up. I would LOVE this book! It would be so wonderful to sit down with my daughter and pick out things in it for us to try together. 🙂 Thank you so much for having this giveaway!! I’m also a subscriber to the email feed! And I just shared this giveaway on my Facebook fan page for my blog! I have never heard of sourdough pasta… sounds very interesting! I would love to try it! I am subscribed to Keeper of the Home through RSS feed on my computer! Love it! I shared about the giveaway on my facebook page! Oh wow, I’m hard pressed to pick one I want to make the most! I would start with cinnamon rolls because I loooove this and would love a sourdough version! I’m wanting to make sourdough b/c we just discovered a food allergy in our home that makes it necessary for me to make bread at home! I love the taste of sourdough. I have tried making it before, but didn’t keep up with it. I would love to learn how to make it easier and have all those great recipes to use it with! I would love to try the Honey Whole Wheat Bread. I’m quite interested in sourdough bread. I’ve been looking for ways for our family to clean up our nutrition without cutting out things we love — like bread. Learning how to make sourdough bread as a nutritious treat would be a great gift! I love sourdough! I love that it helps ease the digestion of the grain. This looks delicious!! I will try it on my own!!! Can’t wait to taste it!